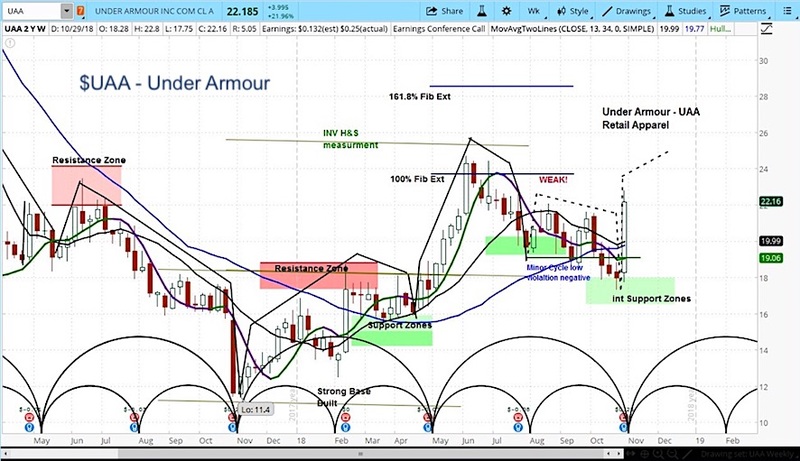 Under Armour stock (UAA) is trading over 20% higher on Tuesday after posting earnings that doubled Wall Street expectations. The apparel company reported earnings per share of $0.25 and total revenue of $1.44 billion, compared to analyst estimates of $0.12 and $1.42 billion. With international sales up by 15%, Under Armour management raised its earnings outlook for the year from $0.16-0.19 to $0.19-0.22. “Today’s results demonstrate that we are tracking well against our effort to build a stronger, leaner, more operationally excellent company,” explained CEO Kevin Plank. 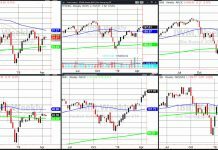 Looking at the market cycles for UAA, we can see that the stock is now in the rising phase of the current cycle. Coming off of a well-timed bottom, we believe UAA will surpass this years highs in coming weeks due to the fact that we are still quite early within this cycle.